How much does it cost to travel to Castro? How much money will you need in Castro? The average price of a hotel for a couple is CL$20 ($0.03). Additional pricing is in the table below. These average travel prices have been collected from other travelers to help you plan your own travel budget. 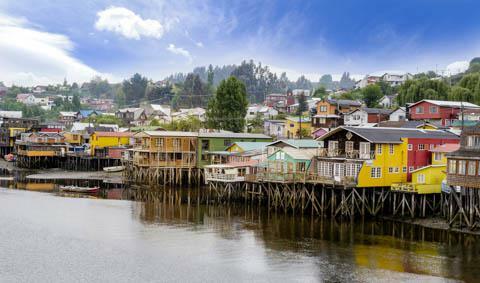 The capital of Chiloe, modern and dynamic, has succeeded in keeping its authenticity even though it now has many gigantic supermarkets, hotels and other touristic infrastructures. It is located on the island's eastern coast, halfway between Ancud in the north and Quellon in the south, and is a convenient base for exploring the stunning sites in the region of Chiloe Island. The tourist information is located on the town square in front of the church. Visit the Iglesia San Francisco de Castro, opened from 9h30 to 20h in January and February and from 9h30 to 12h30 and 15h30 to 20h30 from March to December. Neo-Gothic and Classic styles are combined in the architecture of the famous Iglesia San Francisco de Castro, designed by Italian architect Eduardo Provasoli and completed in 1912. Just 4km south of Castro is another of Chiloe's Unesco-recognized churches, restored in 2012. The Iglesia Nuestra Senora de Gracia de Nercon was built from cypress and larch wood between 1887 and 1888, its prominent 25 m tower can be viewed from Ruta 5. In Castro, check out the Feria Alcalde Jose Sandoval Gomez, a well-conceived fresh market, new in 2016. While it is located a bit off the beaten path, it is worth the trip for its colorful architecture and wide range of island treats (fresh cheeses, local potatoes, fish etc) arranged in a very pleasant and orderly fashion. Walk to the Puente Gamboa Mirador. The east side of the bridge into town offers the best viewpoint for Palafitos Gamboa. The small Museo Regional de Castro near the Plaza de Armas offers a collection of huilliches relic, music instruments, traditional farming tools as well as black and white photographs of the 1960's earthquake to recount the history of Chiloe. For those who plan an excursion to visit the penguin colonies of Monumento Natural Islotes de Punihuil (USD$27), Ancud forms a great starting point. You can also do whale watching, bird watching and trekking or kayak along the bay around Ancud. The Centro de Visitantes Immaculada Concepcion is a fabulous museum located in an old convent, which informs you on the 16 churches classified by the UNESCO and their complex wood structures. The entrance fee is only USD$1 and the museum opens from 10h to 19h from December to February and from 10h to 18h from March to November. You may also appreciate the Museo Regional Aurelio Borquez Canobra also called Museo Chilote (USD$1 for adults and USD$0.50 for children), which will inform you about the history of the island. North-west of the city, the remains of the XIX century fortress, the Fuerte San Antonio, opened from 8h30 to 21h from Monday to Friday and from 9h to 20h from Saturday to Sunday, are also worth visiting. If you decide to travel to Isla Quinchao, local buses leave every day to Dalcahue and to Achao with a stop in Curaco de Velez for only USD$2.50. You can spend a few hours wandering around the famous Artisan Market of Dalcahue, a small town 20 km north of Castro. You can also visit the XIX century church, Nuestra Senora de Los Dolores, also classified as UNESCO World Heritage. Then, after jumping on the ferry to reach the Isla Quinchao, you can make a stop in Curaco de Velez, a town founded in 1660 in typical Chilean architecture. A final stop in the island's largest city, Achao to visit Chiloe's oldest church, Iglesia Santa Maria de Loreto. Finally, head to the Parque Nacional Chiloe (USD$2.30 entry fee), where a great variety of bird species, Darwin's foxes, and a good amount of pudú, the smallest deer of the world are found. You can access the park via Cucao, a small village an hour away from Castro. The most visited trek is the Sendero Chanquin-Cole Cole, a 25 km path along the Lago Huelde, the Rio Cole Cole and the Rio Anay. The Sendero Interpretivo El Tepual will bring you 1 km into the heart of the forest and the Sendero Dunas de Cucao is a 2 km long path will bring you to a long white sanded beach. Like Chile as a whole, a gourmet scene has recently taken off in Castro. When it comes to food, the residents of Chiloe developed a cuisine based on local ingredients. That's why you'll see an endless variety of ways to turn potatoes, seafood and pork into an array of delicious and unmistakably 'Chilote' dishes. Try a curanto, probably Chiloe's most famous dish, which is composed of shellfish, pork sausage, potatoes and different kinds of potato bread and dumplings simply seasoned and slow-cooked. Go for a tasty tortilla de rescoldo, which is a kind of dense unleavened bread that's made throughout Chile, Bolivia and Argentina. The uncooked dough is flattened and buried in the embers of a wood fire that has almost died away but maintains enough heat to cook the bread. Or for those sweet-tooth, taste the succulent apple empanadas. You can enter Castro with a rental car. There is a fee for the ferry, but having your own transport is a very convenient way to explore Chiloe. Castro itself is very small and can easily be navigated by foot. The Naviera Austral ferry makes trips to Chaiten, albeit only in summer. Like in most South American countries, travelling by bus is often the easiest and cheapest option. There are two bus terminals in Castro. The main bus terminal, at the intersection of Sotomayor and San Martín, is where you can find frequent connections to Puerto Montt (about 2 hours, USD$10) on the mainland, as well as Quellon in the south of Chiloe (2 hours, USD$3.50). There are several buses a day to Santiago (16 hours, usually overnight) as well as most major cities on the way. To Argentina, buses to Bariloche depart on Wednesdays and Sundays, but you need to change buses in Puerto Montt (12 hours, USD$22 plus USD$10). All of these buses stop in Ancud on the way, and the ferry crossing is included in the price. You can also find local buses (micros) at the Terminal Municipal, located a few blocks away from the main bus terminal at San Martin and Aldea. Buses to Dalcahue (1 hour), Achao, and Chonchi stop here. The bus to the Chiloe National Park stops here as well.